My daughter's pre-school has an annual Gala that supports the school every spring. Each class is required to contribute a piece of art to be auctioned off at the silent auction during the event. I wrote some background about the thought process that motivated me to choose this project: Art for a School Gala. I needed a project that could be done by a large class (about 18 five year olds) and be appealing to buyers outside of the pre-school section of our independent school. I find silhouette pictures to be so striking. And who doesn't love a skyline picture of a beloved city? I decided to combine the two into one project. 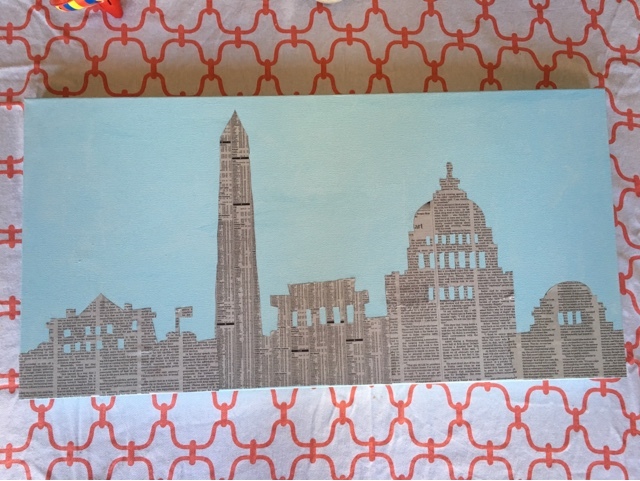 The D.C. skyline was my inspiration for this city silhouette project. I began by making a paper outline of the city. I cut out the buildings using a sharp precision knife to create my tracing template. and I reverse traced the buildings on to newsprint. I chose portions of the newspaper to add visual appeal and was careful to have any articles that contained unsettling or not kid friendly articles. I would like to point out how difficult that is to do when an upcoming election has become the focus of the news. Using the precision knife I cut out each building separately. Once the pieces were cut I pressed them using a stack of books on top of them for a few days. 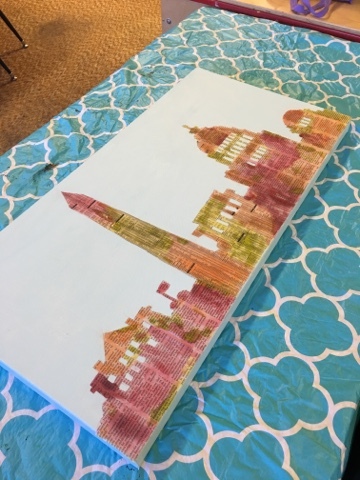 While I waited for the newsprint buildings to flatten out I prepped the canvas. I will note here that I made two of these. One went to the pre-school class to finish the other I worked on at home with my own children. The project that was auctioned off at the school had a white background. When I made the other one I decided to see if painting the canvas with a blue background would offer an different look. 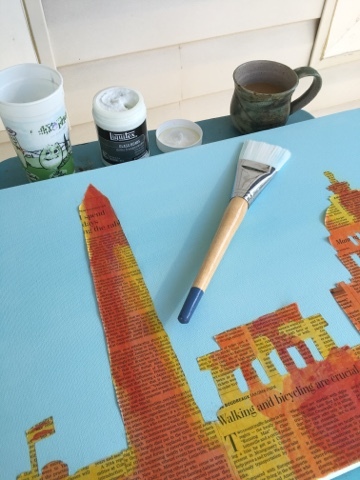 I glued the newsprint buildings to the canvas very carefully. Everything had to be measured and trimmed to fit appropriately. I pained the glue to the back of the newsprint little by little as I gently pressed it to the canvas. I use a bone folder to help smooth out the wrinkles. I allowed the newsprint to set for 24 hours to ensure it was completely dry before going to the pre-school. Because I wanted to prevent a muddling of colors I decided to keep the paint limited to three colors. 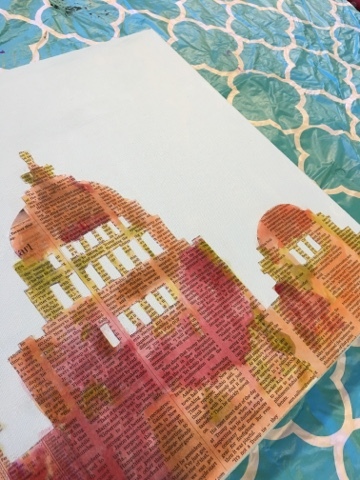 Inspired by how the setting sun makes the marble buildings glow with warmth I thought using yellow, orange, and red would offer a nice feel to the artwork. I diluted the colors in cups with paint brushes. I wanted almost a water color effect to gently pigment the newsprint. I let the children choose one color and paint any where they wanted on the newsprint. I had to monitor them because some over eager children were pressing down hard on the newsprint which made me worry that they might have ripped or scraped off some of the buildings. The children had a great time painting and were so surprised with the final look. I took the canvas home and let it dry for a few days. Then I used a light coat of varnish to seal the artwork. Once the art was fully dry I dropped it off at the school. I have no idea who ended up buying the piece but apparently it was a big hit at the Gala. The once I made for our home has yet to find a place on the wall but will likely end up in the playroom.